Helping you with Jet Ski Gear, Tips, Reviews, and Guides! Why Are Jet Skis So Big?! These things are HUGE! or This thing is the SIZE OF A BOAT! I would get this all the time when someone was seeing a jet ski in person for the first time. I got this comment so often that I’m surprised I’ve never written about it before. Let’s go over why jet skis are so big and explain why it’s not as big as you might think. To be fair, jet skis have gotten bigger through the years. They used to be much smaller back in the 90’s with 2-Strokes engines. These smaller jet skis were for sure more playful and a blast to ride. Towards the late 90’s into the early 00’s things started to change for jet skis. Jet skis started to get big, there was even a time where they were so huge they could hold 4 Passengers. Why Are They So Big? The biggest reason why jet skis are so big is that people wanted them. Everyone wanted something that was stable and able to carry 3 people along with all there gear. This wasn’t a problem at first, the people who wanted a larger ski got them, but many of the manufacturers still made the smaller ones for the customers that crave those. This was before the great recession when everyone wanted the giant Hummer and other large SUVs, and thus people wanted the SUVs of the water. Then the great recession hit, and it created this awkward time for jet skis. No one wanted to buy them because they have gotten so big and also more expensive. From 2008 to 2013 the jet ski world was struggling. They had these big expensive machines no one was buying. They did not have small, simple and cheap machines that part of the market long for. It was a tough time. In 2014 Sea-Doo took the world by surprise and introduced the Sea-Doo Spark. Sea-Doo went back to what made them successful, small and lightweight watercraft that were affordable. For years every manufacturer was in a race to make them bigger and more expensive because that was what the market wanted. Then the recession hit and the market changed. Sea-Doo saw this and came in full force with the Spark. To give you an idea, The Spark started at $4,999 and the year before that the cheapest model was closer to $8k, so it was a big deal. Before the Spark, Sea-Doo was not known as being the cheapest jet ski around, if anything the opposite was true. The Spark brought back a nimble and lightweight machine that was super great on gas. Not only was it cheap to buy but cheap to run and the market ate them up. The name of the Spark came from “re-sparking” the industry, and it did just that. Not everyone wanted or needed a big jet ski. 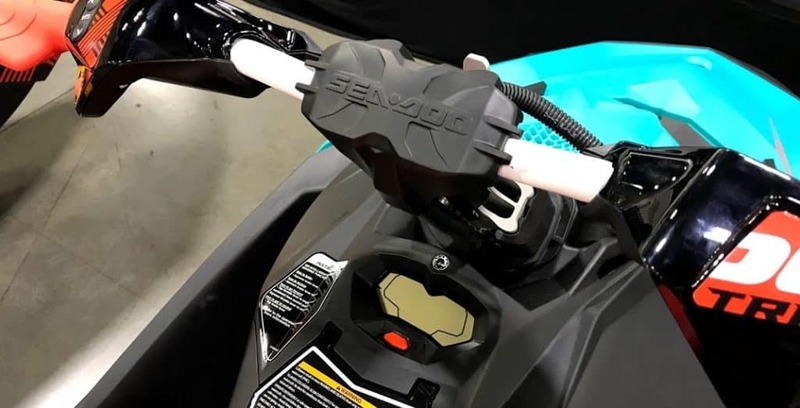 And because of the price point, Sea-Doo got more people in the sport and many of them eventually upgraded to the larger machines. Just because the Spark came around did not mean no one bought the bigger jet skis. If anything, it showed people that the bigger jet skis had there place. And the answer is simple as to why they look so big. They’re not in the water. Usually, a jet skis natural habitat is in the water, so you only see the top half exposed. Not only that but they look big in showrooms but compared to other boats and landmarks they look tiny. When they’re in a showroom they’re usually on stands that get them high off the ground. You can see parts of it you don’t normally see, and it just looks odd to see a boat out of the water. You might be reading this because you’re new to jet skis and not sure which one to get. You may have noticed that they come in a variety of sizes and may be taken back by the big ones. I have a guide here that goes over all the different models. 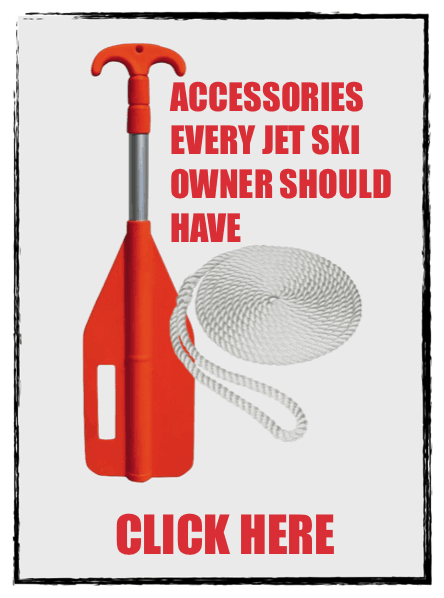 I recommend you check it out along with my must have jet ski gear post. Feel free to explore this site if you’re new to jet skis. I have a beginners section here that answers a lot of questions you might have. Maybe give the GTX or FX series a try, both very stable yet powerful with the options to take it easy. 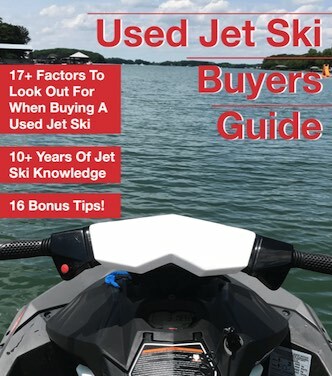 What it Cost to Own a Jet Ski - The Hidden Costs! How far can a Jet Ski go on a tank of gas? Top Speed for Sea Doo Watercraft - How Fast can a Jet Ski Go? Jet Ski Helmet – Do You Need One? Jet Ski Weight Limit – What Does It Mean?